On any given day, Angelenos can be treated to traveling art galleries rich with uniquely American culture and California-grown talent — if only they viewed lowriders, the custom old-school cars tricked out with candy-colored paint, the shiniest chrome and hydraulics, as the artistry in motion they are. That’s all that Estevan Oriol and Mister Cartoon really want. “I want people to realize that these cars are a work of art and our expression,” says Cartoon, a.k.a. Mark Machado. But when many people see lowriders cruising through the city, thoughts of gangs, drugs and violence come to mind. Such expectations, often rooted in stereotypes about the men and women found in the driver’s and passenger seats, rob the long-standing tradition from the familial roots at its core. There truly is more to lowriding than meets the eye. 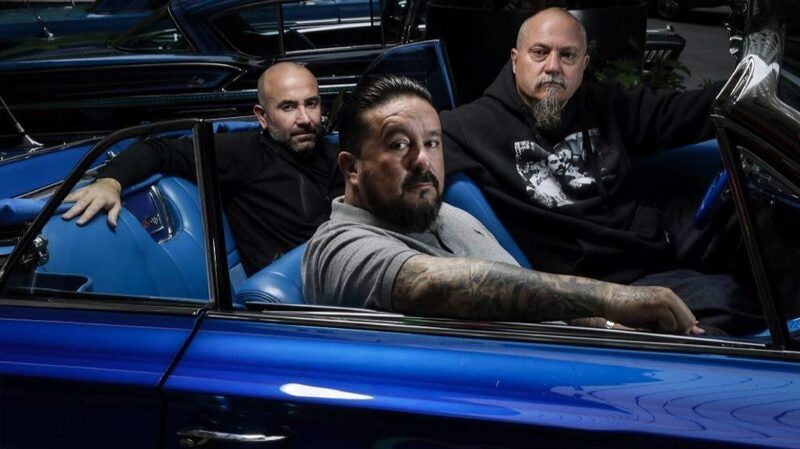 For these reasons, the two heavyweights in East L.A.’s lowriding scene lent their expertise and names, as executive producers, to “Lowriders,” opening in theaters Friday. The film is being heralded as the first major feature inspired by the people and traditions of the lowrider culture. “Lowriders,” is a coming-of-age tale about a young street artist, played by Gabriel Chavarria (“East Los High”), straddling life between his father (a convincing Demian Bichir), who’s all about lowriders; his ex-felon brother (Theo Rossi of “Sons of Anarchy”), who hates their dad, and his need for self-expression. It also stars Eva Longoria, Tony Revolori (“Dope,” “The Grand Budapest Hotel”) and Melissa Benoist (“Supergirl”). Oriol, a bouncer turned hip-hop act manager, photographer and music video director for the likes of Eminem, Travis Barker and Cypress Hill, has been documenting the car-building he and Cartoon have done for 25 years. The idea for the film, more than 10 years in the making, came out of those images. After staging an event for Nike at which they met Brian Grazer, the duo presented doc footage to the Oscar-winning producer known for “A Beautiful Mind,” “American Gangster” and “8 Mile.” Inspired to create a feature, Jason Blum joined the project, which was initially set to be based on the duo’s lives. Lowriders have taken Cartoon and Oriol to Amsterdam, Thailand and Tokyo, among other places. (There is even a vibrant scene in Brazil.) But neither of them thought the breadth of their reach was possible. They just wanted to be the best on the boulevard. “The boulevard is our Studio 54, our nightclub,” Cartoon says. “Everyone takes their car to the boulevard to compete. Most of it’s friendly; you battle with your paint jobs, your hydraulics. It’s about showing off your car’s paint job and your style, because that personality is reflected on that car. And you either have taste or your don’t — or you have too much taste. Being the best, however, gives rise to competition, friendly and otherwise. But all associations of gang violence are actually “on the outside of it,” Cartoon says, especially considering the history of the culture where, “in the ’70s, lowriders were looked at as pretty boys.” While the lowriding community did have clashes with the LAPD, prompting a crackdown in the 1990s, a new generation of “hip-hop cops who knew lowriders aren’t that bad,” Cartoon says, helped usher in the culture’s legal resurgence in the early 2000s.